Did I miss memo? Did we as a species declare war on giraffes? First it’s zoos chopping them up to feed to lions, tigers and other meat eaters. And now we’re sticking them in pens and shooting them as they eat? 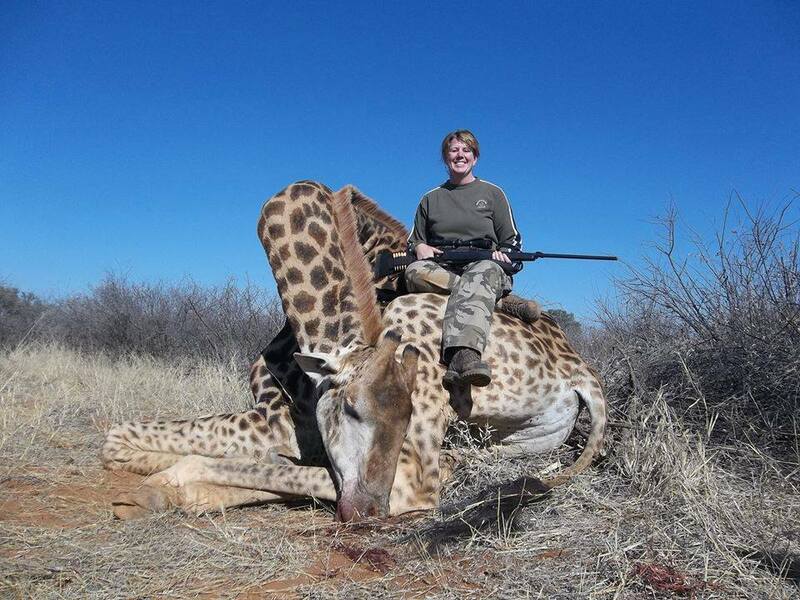 Thank god there are people like her contributing to society by killing these dangerous giraffes. So glad these expensive safari hunts is a First World tradition. What perils would Third World countries be in without dictatorship by rich people with guns? In this photo, a female trophy hunter sits smirking on top of the giraffe she blasted to death with a rifle as it ate from a tree. With these kinds of “hunts,” wealthy individuals are usually driven to the spot by guides who know where the animals are. The clients then shoot and kill the animals, often while sitting in the Land Rover that brought them. Even more unconscionable, some safaris are “canned hunts,” in which captive animals raised this purpose, are placed inside a fenced-in enclosure for the “hunter” to shoot. “We took Shelley out this morning with the thoughts of maybe getting a giraffe. We found this big bull feeding in the trees, and Shelley put 2 good shots in him before he went down. Big mature bull. We have it all here, and we want to share it with YOU”.